Charlie Bates, a recent BMus Jazz graduate from Royal Birmingham Conservatoire, has been awarded the main Johnny Dankworth Jazz composition prize for his piece 'Eyes Open'. 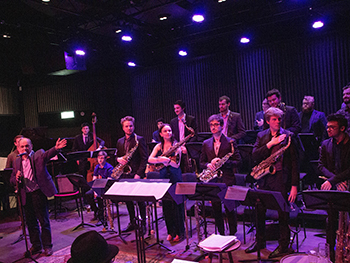 The Conservatoire was delighted to host the prestigious Dankworth and Eddie Harvey Awards on 10 March 2019 in our own Eastside Jazz Club, where all the winning pieces, including Charlie’s, were performed. The Dankworth Prize was established by Art Mead in 2007, and has been administered by the Musicians’ Company, generously sponsored by the Wavendon Foundation, since 2011. Every year the Company gives a range of awards, scholarships and medals, which make a real difference to the lives of outstanding young singers, composers and instrumentalists as they make the transition from study to a professional career in music. The winning piece Eyes Open was written when Charlie was still studying at the Conservatoire and it is the second part of a two-part piece. The work also featured Conservatoire alumnus and Jazz Tutor Percy Pursglove, who takes a flugelhorn solo on the recorded version. The Conservatoire trained me to be a working professional musician which was exactly what I wanted! I had a hugely inspiring and memorable four years at the Conservatoire, which put me in good stead for the real world. I made some great friends during my time there and always feel very nostalgic returning to Birmingham. The members of the Musician’s Company were full of praise and compliments about RBC’s Jazz Department, the students’ level of playing, the Eastside Jazz Club venue and the Conservatoire in general. This was the first time the Dankworth awards had been held outside of Greater London.